Most of us must be using GMail as their Primary E-mail address for frequent use. Recently, I’ve discovered the fact that Google’s E-mail system, GMail’s Contacts is having its own stand-alone page, which can be used independently without logging in GMail. The URL for this purpose is not user friendly, as it is very long. 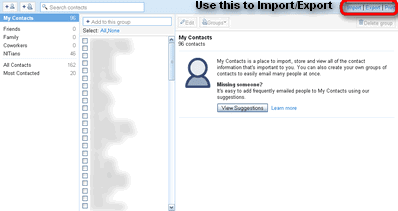 You can use the above mentioned URL to manage your contacts in group and for Importing/Exporting contacts to your Hard Drive.